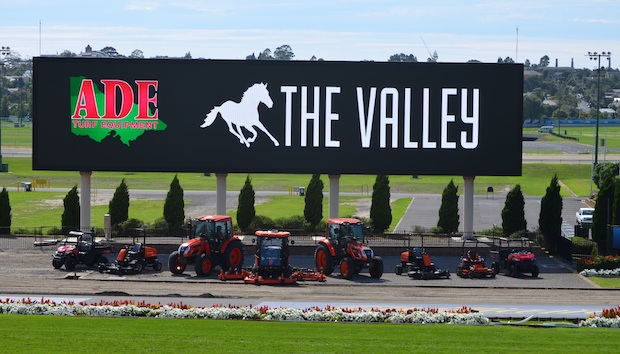 Moonee Valley Racecourse has updated their fleet with an orange army of Jacobsen equipment, taking down fuel costs and cutting time. Moonee Valley Racecourse and Facilities Manager, Marty Synan said his staff is happy with the new equipment, which was supplied by local Jacobsen dealer ADE Turf Equipment. “We have a long term relationship with ADE, and we have bought a lot of equipment from them in the past. In the end it came down to a financial decision, and Jacobsen’s equipment worked well for what we need here,” Synan said. The new fleet, which includes the Jacobsen HR-9016; a 100 horsepower 16ft cutting machine, has been at the course for just two months now, but Synan said the updated machinery is already showing its value. “We’ve definitely seen an increase in productivity; our old mower used to take just over three hours to cut the track, now we can complete it in about an hour and 20 minutes. Because we race at night, we generally mow straight after the last race, around 10pm at night. “I’ve noticed a difference in the way the track performs too, because it’s getting a better cut all the time now. Even the surrounds and carpark is being kept a lot cleaner,” said Synan. ADE Turf Equipment Sales Manager, David Ward said the purchase was a big decision for Moonee Valley, but cutting quality is paramount for a racecourse. “You get a nice cut from Jacobsen equipment. Of course on a racetrack these days with television and constant media, that is really important. It will come up perfect for TV. Moonee Valley were looking for the best possible cut they could get and obviously the best type of machine to save themselves some time,” said Ward. The Jacobsen 16ft mower is also great for operator comfort, complete with air-conditioned enclosed cab. Synan said he has noticed his staff have a bit more care in the equipment and their work now with the new Jacobsen equipment. “It’s probably changed the guys’ attitude towards how they treat the equipment and use it. They don’t just jump on it, mow with it and put it away, they actually take a bit of pride in what they’re doing; making sure they do all their pre-start checks and that everything is washed and cleaned after use – I’ve noticed that as well,” he said. While Moonee Valley’s new Jacobsen machinery is proving its worth quite quickly, there are certain areas, such as servicing and maintenance that will also show value later down the track. “The deal we did with ADE gives us two years of servicing, so every month the machines are serviced giving us less breakdown time. Also, we used to have a pretty mixed bag of machinery, so essentially we were buying multiple parts from different companies. Now we’ve got all Jacobsen machinery and Kioti tractors, so it just means we can go to the one dealer, and it’s just a lot more efficient. We won’t see all the benefits for 12 months or so, but long term we should see some great savings across the board. We’re very happy with the Jacobsen equipment, we feel we’re getting the results we’ve always wanted,” said Synan. Click here to find a Jacobsen Dealer near you. 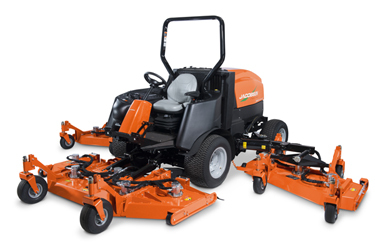 Head to the ADE Turf Equipment website to see their Jacobsen range.